Getting interested in British Politics was probably one of the hardest things for me to do as a foreigner. It wasn’t as dramatic, and intense as politics back home. Understanding the constitutional monarchy, the different parties, the devolved governments, and how the Kingdom is run was monotonous and confusing. The more I read the more I understood and the less exciting it got; that is until I came across the Door Slam Scene. This scene takes place at the State Opening Parliament Ceremony that happens in the New Palace of Westminster also known as The Houses of Parliament. Visiting the parliament was one the most effective ways to understand and translate everything I read and listened to visually. 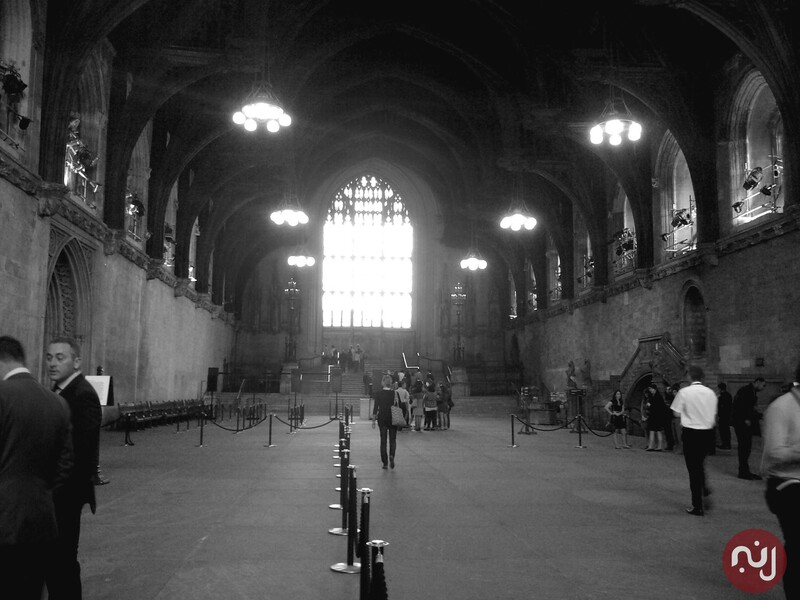 As I walked into the Royal Robing Chamber, I felt like I was walking in the footsteps of a Queen. In this room the Queen puts on her robe and the extravagant Imperial State Crown. She enters the House of Lords with the duke; everyone in the hall stands up, as she sits on her throne. An official who is called the Black Rod then walks from the House of Lords to the House of Commons to summon MPs (members of parliament) and invite them to hear the Queen’s speech. When he reaches the chamber, the door gets slammed in his face, and he must knock three times before he is granted permission to enter. I repeat…a senior officer gets the door slammed in his face, in front of government officials and national TV!! This is a powerful reminder that parliament comes before the state; it symbolizes the independence of the House of Commons. The Queen then reads her speech, which explains the laws that the current government plans to implement during the year. What’s striking about visiting the parliament and watching the ceremony on TV is that you somehow forget that you are in the 21st century. The only thing that reminded me of the technologically advanced world we live in, was a digital clock hung in the House of Lords. I salute you Britain for holding tight to your traditions! This entry was posted in Entertainment, London by sousalz. Bookmark the permalink. nice one, Sara :)! Can’t wait to go there!